This is just one, of several nice snook we caught today south of Everglades City. With the water temps moving back Into the mid 70’s, the snook fishing should remain good. 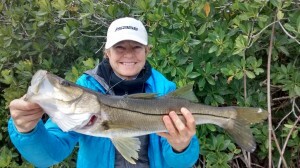 Snook season opens march 1st, so don’t miss out on some great fishing! Give me a call, and let’s get out on the water and catch some fish!